Fifteen-year-old Tom lives in the murky, sooty city of London, where he helps his father to run a print shop. Among the customers is wise old Dr Harker, a retired physician and seafarer, whose patient demeanor and fascinating tales endear him to Tom. 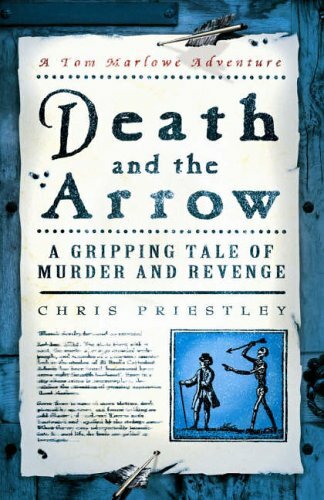 When Tom and Harker hear a newspaper seller announce a most curious murder in the city, with the victim pierced by an arrow and left holding an illustrated card of 'Death and the Arrow', they are both intrigued by the mystery. As subsequent 'Death and the Arrow' victims are discovered, the mystery closes ever more tightly round the city and intrudes even into Tom's own life. From then onwards, he can't rest till he has discovered the truth behind the murders. This is a really atmospheric venture into the eighteenth-century, combined with a gripping mystery plot, that will fascinate and engage readers of ten and upwards. It was books like this one that turned me into a bookworm in the first place! From the very first page, there’s excitement and adventure, engaging characters and a murder-mystery that will keep you guessing till the last page. Chris Priestley is a bold writer who dares to tread where other’s fear to go, which means we’re treated to a thrilling story that wouldn’t be out of place in any crime collection. This is the perfect book for readers to explore both historical fiction and daring action-adventure.